If you are anything like me, and have been intently watching Herbivore, and have been wondering whether this much-hyped natural beauty brand is worth trying– then I can answer your query by saying yes. Naturally my initial purchases had to be a couple of their face oils, and I was admittedly, in part, seduced by the gorgeous packaging. However, I had a suspicion that beauty was more than skin deep, and the contents would befit the elegant packaging, or better yet, that the packaging would befit the divine contents. My suspicions were correct, and my purchases have proven very worthwhile. Herbivore is a 100% Cruelty-Free company that makes their products in small batches in the USA. Their eco-friendly and sustainable products do not contain mineral oil, parabens, chemical preservatives or any harmful ingredients. 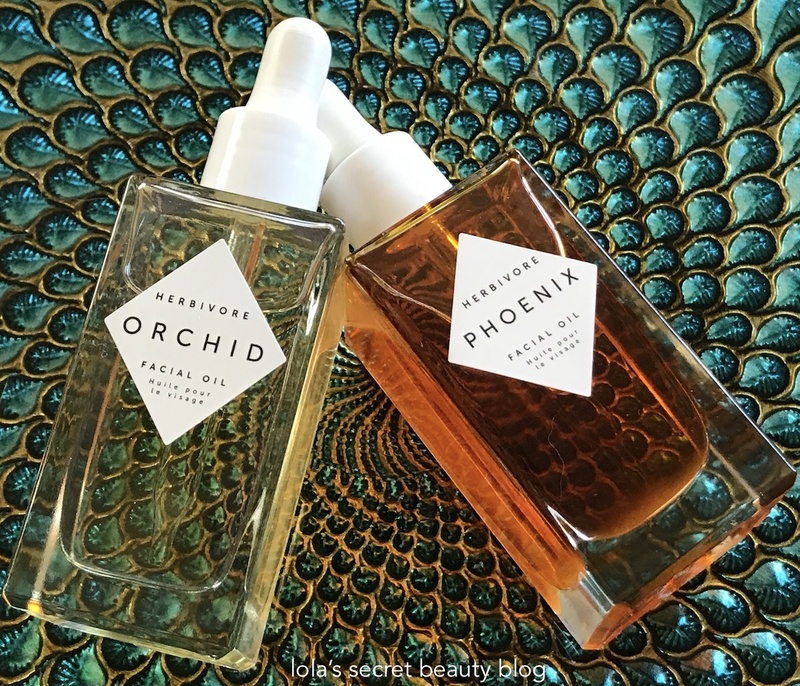 Herbivore Phoenix Facial Oil: This is a Jojoba Oil-based facial oil that is cell regenerating and nourishing, and it is formulated for mature and sensitive skin. Herbivore Orchid Facial Oil: This is a Coconut Oil-based facial oil that is a "youth preserving" and nourishing for normal skin. Herbivore Lapis Facial Oil: This is a Squaline-based balancing facial oil, which is derived from olives, that is formulated for combination and acne-prone skin. Herbivore Orchid Facial Oil ($64.00 for 1.7 oz. 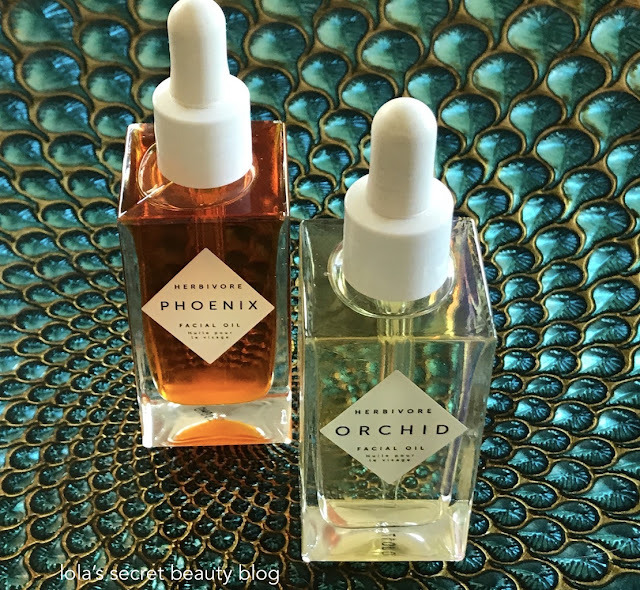 from Nordstrom, Credo Beauty, Sephora, Dermstore, Revolve and Sephora inside JCPenney): Formulated for normal skin, this gorgeous lightweight and fast absorbing oil leaves skin soft, silky smooth, hydrated and with a pronounced dewy glow. The antioxidant and Omega-rich formula nourishes and protects the skin, while the delectable Camellia and Jasmine aroma delights the senses. The fractionated Coconut Oil, which is the carrier oil, is used in this effective formulation to ensures that this elixir effortlessly melts into the skin without leaving behind a greasy residue. 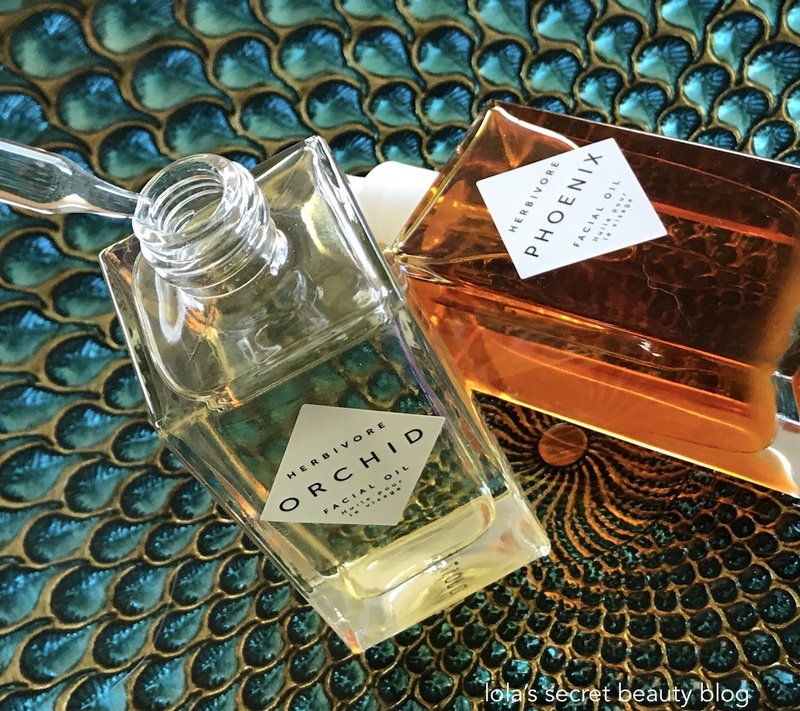 Orchid Extract: "A natural humectant that draws moisture to the skin. It works to smooth and condition. It is also a powerful antioxidant that fights against the oxidant effects of free radicals and premature aging. Additionally, it contains important minerals such as Calcium, Magnesium, and Zinc for skin to absorb." Camellia Flower Oil: "Known in Japan as Tsubaki Oil and used for centuries in skincare by the Japanese. It is a lightweight oil that easily absorbs into the skin. Rich in skin-cell-renewing fatty acids Omega 3 and 6, it naturally increases skin's elasticity and gives it a luminous glow." Jasmine Sambac Oil: "Comes from the night blooming variety of Jasmine. It is a sweet and exquisite oil that has been used in skincare and perfumery for centuries with good reason — the scent is intoxicating and the oil itself works to increase the skin's moisture content and increase its elasticity." 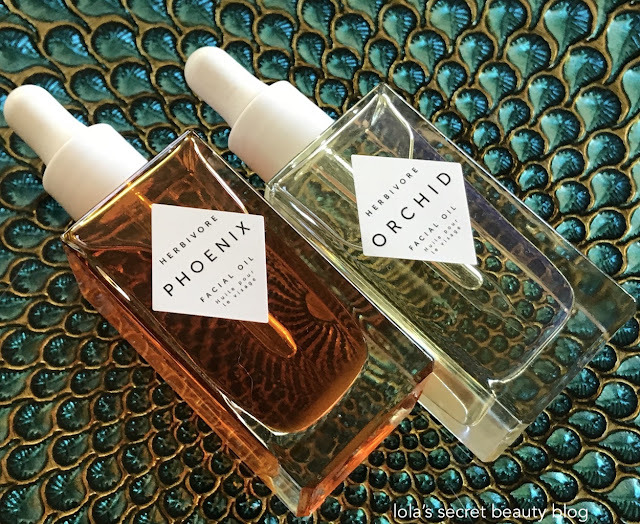 Herbivore Phoenix Facial Oil ($88.00 for 1.7 oz. from Nordstrom, Credo Beauty, Sephora, Dermstore, Revolve and Goop): Formulated for mature and sensitive skin, this delectable lightweight and fast absorbing skin effortlessly melts into the skin and immediately hydrates, calms and nourishes the skin. Skin feels indescribably soft, smooth, moisturized and pampered. It is a wonderful soothing and calming elixir for irritable and inflamed skin, and is a wonderful post-peel choice to help heal the skin. This antioxidant-rich formula, which uses Jojoba Oil as its carrier oil, offers deep moisture without any residual greasiness, but instead leaves the skin with a distinct luminous glow. After prolonged use, it softens the appearance of fine lines and helps to heal and repair damaged tissue. It has a lovely light rose aroma that is a treat to the senses. Rosehip Oil: "Comes from the fruit of the wild rose plant, naturally rich in essential fatty acids Omega 3, 6, and 9 that regenerate skin cells and repair damaged tissue. Rosehip is also high in Trans-Retinoic Acid which aids in preventing premature aging." Sea Buckthorn Oil: "The richest natural source of Beta Carotene available. Beta Carotene is a natural form of Vitamin A that penetrates deeply into the skin to restore and revitalize from within." CoQ10: "An important, naturally occurring substance that assists in producing biological energy within the cells. After the age of 30, the body produces less CoQ10 each year which in turn decreases the skin's natural collagen production and ability to regenerate skin cells. Nourishing the skin with natural CoQ10 can increase the skin's collagen production, leading to greater skin elasticity and less fine lines and wrinkles. It also boosts the skin's ability to regenerate itself. CoQ10 is a very small molecule that can easily penetrate into the skin." Chia Seed Co2: "An excellent natural source of Alpha Lipoic Acid to smooth fine lines and decrease inflammation while increasing skin's natural glow and radiance. It is also the richest source of Omega 3 found in nature which makes it extra nourishing to the skin. Additionally, it is high in antioxidants and photo-nutrients to protect against premature aging from sun exposure." Meadowfoam Oil: "Known for forming a natural protective barrier to keep moisture and vitamins in the skin. Additionally, it works to naturally preserve the other oils around it." Neroli Oil: "Has been used for centuries to soften wrinkles, reduced veins and capillaries, and stimulate new growth in skin cells." WOW the packaging on these is EVERYTHING! Right?!!!! I absolutely love their packaging, but what's inside is pretty amazing too! Yes, it's a pretty remarkable brand. It's hard to keep up with all of the brands on the market, but this one is definitely worth trying. 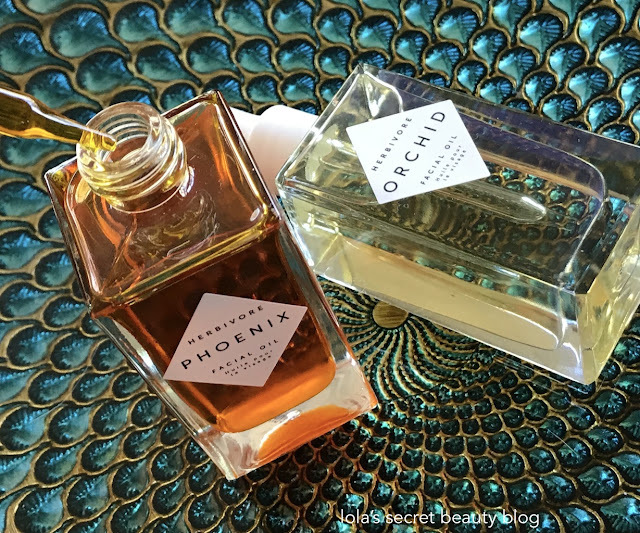 Yes, Phoenix Facial Oil would be the perfect choice to try for your dry skin, and I do think that you would like it. It is really nice that they offer the smaller size! You might also try to get a free sample at Sephora– provided that it is in a sealed container, rather than a sample made from an open bottle tester. I'm actually going to Nordstrom tomorrow so hopefully I'll be able to sniff these out. You make them sound delightful. I hope that they have them in-store at your location– I would love to see what you think about them. They really are delightful. I think that Phoenix might be a good fit for your skin, and its aroma is more mild than that of Orchid– so that one might actually work for you. You are right, they look absolutely divine! Aren't they beautiful?! The oils themselves are really lovely, and definitely worth trying!